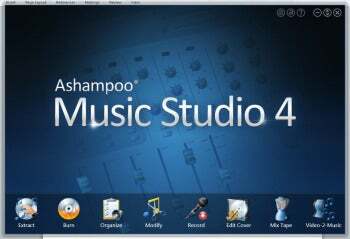 Ashampoo Music Studio 4 ($29.99, 10-day trial) is a classy step up from an already sweet little suite of audio tools. It has modules that let you edit, rip, record, play, convert, organize, burn audio discs, and even design and print labels and jewel case inserts. Ashampoo Music Studio's major additions to version 4 are the cataloging of files and ripping audio from video files, but there's no longer an audio file repair tool. Much prettier than in its former incarnation, Music Studio 4's interface moves you back and forth through its tools easily. Music Studio 4's interface is significantly improved in both appearance and the little details versus version 3. It's exceedingly simple to use and navigates much like a Web browser. Speed is said to have been increased with multi-core and thread support, though I didn't find the program particularly slow before. In general, audio files are tiny compared to the video that still chokes many systems today. One oddity in the new organizer is that when you quit the process of adding files, it throws everything away. Most programs will keep the files already added instead of forcing you to add them again. Other than that, every tool in Ashampoo Music Studio 4 was easy and effective. The wave editor is nice, though it would be nice to be able to drag files to it rather than navigate with a dialog to open them. Ashampoo Music Studio 4 handled WMA, OGG, FLAC, and 16-bit wave files easily, but it still has no support for iTunes .mp4 and AAC files. Vendor Ashampoo has added support for the 24-bit and 32-bit wave files produced by my high-end DAW software, which is nice. Most users will only care about the lack of support for iTunes-file types. Ashampoo Music Studio is a more-than-capable program that is great for the average user who wants simple, effective tools for manipulating audio files. It even burns to Blu-ray discs. However, I'd hate to review version 5 and not find support for APE and Apple formats. Ashampoo Music Studio 4 adds cataloging and a neater interface to an already nice suite of audio tools.